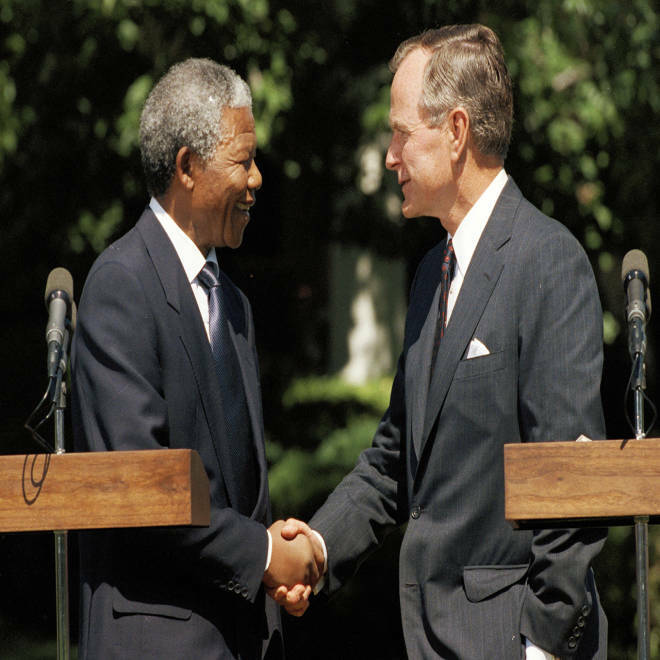 President George H. W. Bush shakes hands with South African national leader Nelson Mandela at the White House in Washington, June 25, 1990. Presidents Carter and Reagan and Congress had all instituted sanctions against the white minority South African government because of its policy of racial apartheid. But in 1986, Reagan condemned Mandela’s group, the ANC, which was leading the black struggle against the apartheid regime, saying it engaged in "calculated terror ... the mining of roads, the bombings of public places, designed to bring about further repression." The publication referred to Mandela, who had once led the ANC’s military wing, as part of the "leadership," though by then he had spent more than a quarter century in prison. It also accepted the apartheid regime's claim that "ANC's operations -- which heretofore had sought to avoid civilian casualties -- abruptly changed. Attacks became more indiscriminate, resulting in both black and white civilian victims." Five months before the report was issued, the ANC had taken responsibility for some attacks that resulted in civilian deaths but had pledged to prevent a recurrence. Leaders around the globe remember Nelson Mandela's fearless generosity, leadership, and remarkable force for change. NBC's Andrea Mitchell reports. The report also claimed significant links between the ANC and Communist countries, noting that the ANC "receives support from the Soviet bloc, Cuba and a number of African nations in addition to contributions from the West." The DoD report added that the ANC received many of its weapons from the "Soviet Bloc" and listed among its "political objectives" the establishment of a "multiracial Socialist government in South Africa." When the Defense Department’s report was issued, State quickly distanced itself from the harsh, Cold War rhetoric. Despite its own earlier dire characterization of the ANC, it called the group "a politically diverse organization, representing a range of views. It is the oldest black nationalist movement in South Africa." But the Defense Department stood by its language, and Mandela and other ANC officials remained on the terror watch list even as President Bush welcomed Mandela, newly released from prison, to the White House in 1990. Because of what was described as a "bureaucratic snafu," their names were kept on the list until 2008, 14 years after Mandela had been elected president and nine years after he had left power. He was 90 at the time. 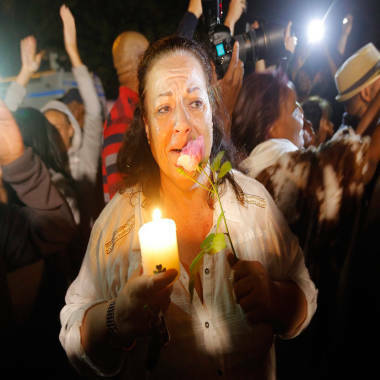 Mourners pay tribute to South Africa's revered anti-apartheid icon, who died on Dec. 5, 2013. "This is a country with which we now have excellent relations, South Africa, but it's frankly a rather embarrassing matter that I still have to waive in my own counterpart, the foreign minister of South Africa, not to mention the great leader Nelson Mandela," Rice said. Mandela was imprisoned in 1964 after being arrested and charged with sabotage, specifically a campaign against the country's power grid, and plotting to overthrow the government. No one was injured in the sabotage campaign. He was released in 1990, at age 71. He was elected president of South Africa in 1994, in the country’s first full and free elections, and served until 1999.